On January 21, 2019, the Mules sent the following email to CalTrans and CHP agencies responsible for the I-5 CALL-DUN-DRUM, the 7.9 mile stretch where the Old Pacific Highway Trail ends at Las Pulgas Road to Oceanside. The Mules are still waiting to receive a response. Dear Sirs/Madam: The Mules are delivering this letter to yourself to inform you that the Mules like last year will once again be needing to traverse the CALL-DUN-DRUM, the 7.9-mile stretch where the Old Pacific Highway Trail ends at Las Pulgas Road to Oceanside. Last year, we were trying to head north from Oceanside to the trail, when we (The Mules) were abruptly stopped by CHP and told to remove ourselves from the Public Thoroughfare. This 7.9-mile stretch of confusion where the rule of law has been suspended and was responsible for the Mules’s arrest and illegal incarceration on February 23, 2018. All citizens of the United States have the rightful and free use of the public thoroughfare guaranteed by the U.S. Constitution. It is unlawful to deny any one venue the right to that use. The Mules will expect the events of last year not be repeated. 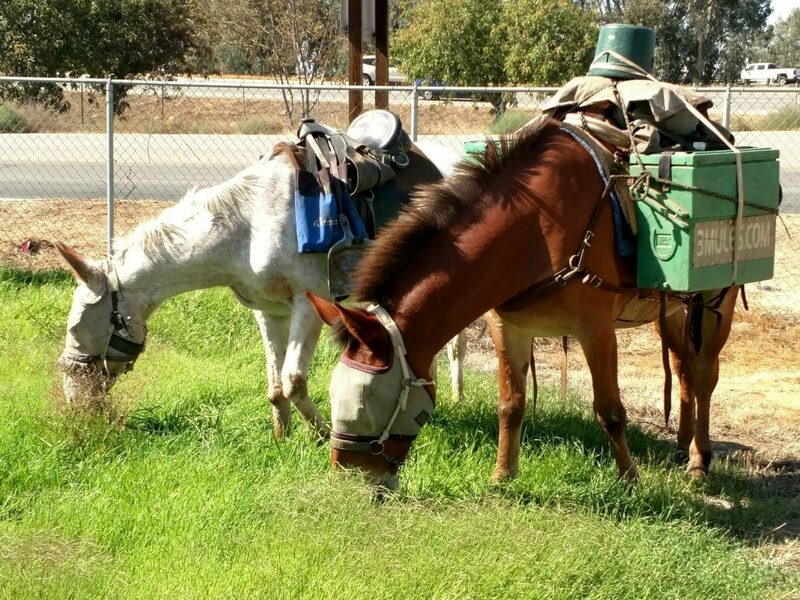 In a few days, the Mules will be arriving to Old Pacific Highway Trail/Las Pulgas Road. The Mules are requesting a trailer ride to Oceanside in the 7.9-mile stretch of I-5 that is closed off to pedestrians and equestrians. Last year rather than using the trailer acquired by CHP to transport us thru the 7.9 mile CALL-DUN-DRUM, CHP used the service of the Humane Society trailer to take Little Girl 30-miles to Escondido Animal Shelter and myself 15-miles to Vista Detention Center. In August 2015 when the Mules needed to cross the Golden Gate Bridge, which allows cyclists and pedestrians access to the sidewalk but not equestrians, the Golden Gate Bridge District contacted the Marin Humane Society, who picked us up on the north end of the bridge in a trailer and dropped us off in San Francisco. Since CHP contracts with the San Diego Humane Society, we are requesting a number to call when we reach Las Pulgas Road trailhead parking for trailer ride to Oceanside. No more than a three hour advance notice to Caltrans/CHP by any equestrian seeking to traverse the 7.9-mile Call Dun-Drum will be required. The Mules and their nomadic way of life without question is one of those modes. I am a native Californian. 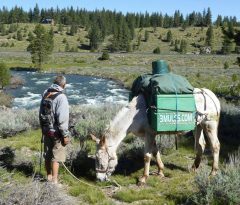 My mules and I have lived this nomadic way of life for the past 35 years. We don’t live in houses and we don’t drive cars. We are always outside and this is our way of life. If the State of California/Caltrans mission statement is to improve the quality of life for all Californians, denying the Mules access to the Public Thoroughfare is a gross violation of the mission statement. As the Mules understand from our experience from last year, Caltrans/CHP were the responsible agencies that had us arrested. We are requesting these agencies to inform San Diego Humane Society, which we understand handles the large animal issues for San Diego County, that the Mules will be needing a trailer ride thru the I-5 CALL-DUN-DRUM. Please provide the contact name and number for the appropriate person to handle this issue so we can arrange a trailer ride to get thru this 7.9-mile section of the I-5 CALL-DUN-DRUM. The Mules are once again approaching the I-5/Camp Pendleton CALL-DUN-DRUM from the north going to the south as opposed to the last year 2018 going from the south to the north. This CALL-DUN-DRUM once again 2019 is seeking to right itself like a ship at sea. The Mules once again find themselves as passengers. On February 23, 2018, the Mules left Oceanside to go north to San Clemente taking I-5. Unlike cyclists, pedestrians and equestrians have no alternative route, no trails, no frontage road, for this 7.9-mile stretch from Oceanside to Las Pulgas Road trailhead. Since Camp Pendleton denied pedestrian access to the Mules which they’ve granted the Mules three times previously, the Mules used the wide shoulder of Interstate 5 (I-5) to walk north. We were summarily approached by CHP and told to turn around, go back. We refused and were arrested. A trailer was summoned by CHP and Little Girl was taken to the animal shelter and I was taken to jail. CHP could have just as easily trailered us 7.9-miles to the north end of the CALL-DUN-DRUM rather than take myself 15-miles to Vista Detention Center and Little Girl 30-miles to Escondido Animal Shelter. The Mules will soon be contacting CalTrans to provide a trailer ride for the Mules or any equestrian needing to traverse the 7.9-mile CALL-DUN-DRUM from north to south (Las Pulgas Road Old Pacific Highway trailhead to Oceanside) or south to north with not more than 2 hour notice. A trailer ride was the solution provided for the Mules in August 2015 when needing to cross the Golden Gate Bridge, which allows cyclists and pedestrian access but not equestrian access. The Golden Gate Bridge District contacted the Marin Humane Society who picked us up on the north end of the bridge in a trailer and dropped us off in San Francisco. Likewise for the I-5 CALL-DUN-DRUM, Caltrans can contact the Humane Society to trailer us from Old Pacific Hwy/Las Pulgas Road trailhead to Oceanside since it was the Human Society that picked up Little Girl last year and brought her to the animal shelter. The action they took against Little Girl and myself was hardly compatible to their mission statements. It was anything but. It was 180 degrees to the contrary of serving the various modes of public use (pedestrians, cyclists, Equestrians, wheelchairs) on the Public Thoroughfare going from Point A to Point B. Caltrans and CHP are not in synch with their mission statements nor with Vehicle Code 21949 passed by the State Legislature. (a) The Legislature hereby finds and declares that it is the policy of the State of California that safe and convenient pedestrian travel and access, whether by foot, wheelchair, walker, or stroller, be provided to the residents of the state. (b) In accordance with the policy declared under subdivision (a), it is the intent of the Legislature that all levels of government in the state, particularly the Department of Transportation, work to provide convenient and safe passage for pedestrians on and across all streets and highways, increase levels of walking and pedestrian travel, and reduce pedestrian fatalities and injuries. Per the California Highway Patrol website: “The mission of the California Highway Patrol is to provide the highest level of Safety, Service, and Security.” Isn’t it ironic that above this mission statement is three CHP officers on HORSES. On Caltrans website is their posted mission statement to “Provide a safe transportation system for workers and users, and promote health thru active transportation and reduced pollution in communities.” The Mules mode of transportation promotes health and reduces pollution in communities because we’re traveling by foot. Caltrans strategic objective states: “Improve the quality of life for all Californians by providing mobility choice, increasing accessibility to all modes of transportation and creating transportation corridors not only for conveyance of people, goods, and services, but also as livable public spaces. Frank is no longer on the job. When a horse is chosen to work in an urban area, such as a police horse, the temperament is paramount. Frank did not have the temperament to work and be in an urban area. Unfortunately it was not possible for me to know that beforehand. Frank was offered to us for $250. It cost us $250 to have him trailered to where we were. He was a large young mule, 1400 pounds, and we took a chance, sight unseen and bought him. To keep using Frank in a highly concentrated urban area was an accident waiting to happen. 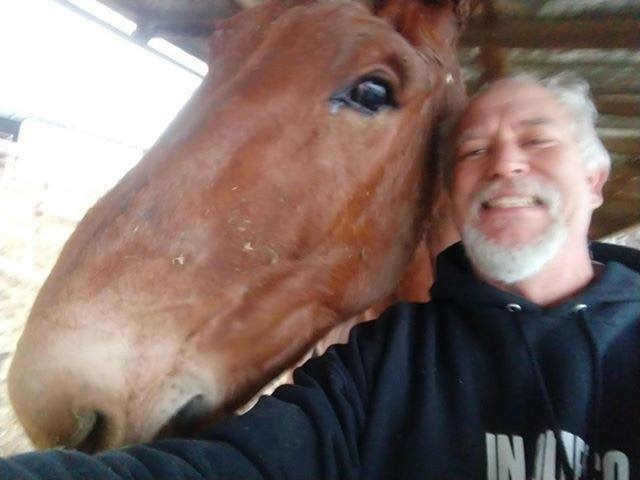 Therefore, the decision was to give him to Larry and Paula who own and run a stable in Bakersfield and have been strong supporters and friends of 3 Mules. We have no doubt that they will provide a good home for Frank. Larry has a mule named Bowie to keep Frank company. So, once again the Monk and Little Girl will be on their own walking in any one of four directions how they choose when they choose one step at a time all day every day regrettably without Frank. On a warm summer day many thousands of years ago, the mules were crossing a wide open valley and they had stopped to graze and rest a bit. Then all of a sudden, the sky became a brilliant blue like the mules had never before seen. All the plants, grasses, rocks, and trees suddenly became multi-dimensional and intense. The mules stood in awe at what they were experiencing. Then the Mules realized they were in the presence of God. The mules looked to the left and the right and they saw all their fellow companions that they shared this beautiful creation – God’s Earth with grizzly, elk, lion, badger, skunk, salmon, eagle coming in and around them. Then all of a sudden as before, the sky became a brilliant lustrous blue and an embracing force of intensity surrounded the mules and all the animal kingdom which had come once again to witness this encounter between God and the mules. A long period of a mystifying calm ensued. Coming into the City of Irvine this morning, the Mules met some Irvine Police Department police officers. They stopped their vehicle, came out to meet us, and told us we were breaking a city ordinance by walking on the sidewalk. The Mules told the officers that all streets, city, state and county roads in this country are public thoroughfares. They are not for the exclusive use of a high-speed machine called an automobile. The Mules informed the officers if the sidewalk was the safest place for us to be that’s where we would be walking not down the road, facing drivers moving at more than safe speeds, distracted by God only knows what hiding behind tinted glass. We then left and told the officers to have a nice day. Five minutes or so later, the officers passes by, pulled out around the corner, stopped their vehicle and we observed them taking our picture. The Mules took their picture. About another 10 minutes or so went by and the City Animal Control vehicle passed us by, pulled up in front of us in a parking lot and observed us walking up the street. We stopped and took their picture. For some reason unbeknownst to us, the city of Irvine has something to fear from a weak little man walking two mules down the public thoroughfare. Is it really us they fear? I think not. What the City of Irvine doesn’t like is a weak little man and two mules walking freely how they choose, when they choose, down the public thoroughfare. The City of Irvine does not like Freedom being expressed in its most basic down to the bone way. But that’s unfortunate because the Mules will never stop walking freely on this Earth in the most basic and down to the bone way, a constitutional guaranteed right of ALL United States citizens. In regards to our phone being stolen on Friday December 21, 2018 around 11pm, the Mules want to make it clear that we weren’t strong armed. The phone was taken while we were asleep. This is the third time that this has happened. I wake up at night and I turn my phone on to listen to music, news, etc. and then I fall asleep with the phone next to me and somebody will come by, see it and take it while I’m asleep. This is a photo of the place the Mules spent the night. We had previously spent the night here before and never had any problems. There weren’t any camps or people around so my guard was down and the phone was stolen. A lot of comments are being made about certain cities and towns that the Mules should not go through. We don’t make any real plans on which cities and towns that we are going to pass. Because of that we have the opportunity to enjoy the varied cities and towns and the various residents of those towns in which we have passed. The Mules don’t intend to stop using the energy of the Nation, the Three Mules Nation, to visit and experience all the various people and citizens of this state because of one person who saw an opportunity to get a free phone. The Mules will be walking through the Christmas holidays enjoying the guaranteed freedom to life, liberty and the pursuit of happiness as it is guaranteed by the U.S. Constitution, the supreme law of the land, as it is to all its citizens within its borders and the Mules will be having a Merry Christmas holiday season because of it. The Mules posted if anybody had a stall Jack that they weren’t using and willing to donate it to the Mules. We want to thank all those who gave a positive response offering the Mules a stall jack. However, the folks at Wind Wolves Preserve offered to repair our old anvil we’ve used for so many years. Thank you Jesus, Alejandro, Alberto, and Landon for repairing our old anvil. A very nice job. They lay their muzzles on the ground with their ears up for short periods of time. That’s how mules sleep. Author MulePosted on 11/28/2018 02/22/2019 Categories Mule's BlogTags 3Mules.com, Kern County, Little Girl, Mules, Wind Wolves PreserveLeave a comment on How do mules sleep? Today is Mule’s 71st birthday. He didn’t want any mention of it on this page, but his mules past and present dressed up for the occasion so had to share. The Mules on Thanksgiving Day found ourselves walking through Bakersfield. It turned out to be a very rewarding day. The sky was clear blue with white puffy clouds. The air was crisp and clear due to the previous night’s rain. Clear blue skies and white puffy clouds are a rarity these days. Most of the time, the skies are silvery white or a dirty grey in color much of which is due to the chemical chem trail spraying over our heads. We also became aware of some lawyers advertising their services. We took their names for we are in the process of drawing up some lawsuits pertaining to our God given right to move and travel freely in this country, how we choose, when we choose, codified in the U.S. Constitution, the supreme law of the land. We will be seeking the advice and expertise of lawyers in the not to distant future. The Mules will consider these gentlemen as possible candidates for the job. There will be no monetary compensation. The reward for these gentlemen lawyers will be spiritual, the value of which will be experienced in a way totally unique to themselves. The Mules know the value of such an effort will be extreme. These gentlemen lawyers, should they be selected from a large pool of candidates, will have no regrets for their services rendered.